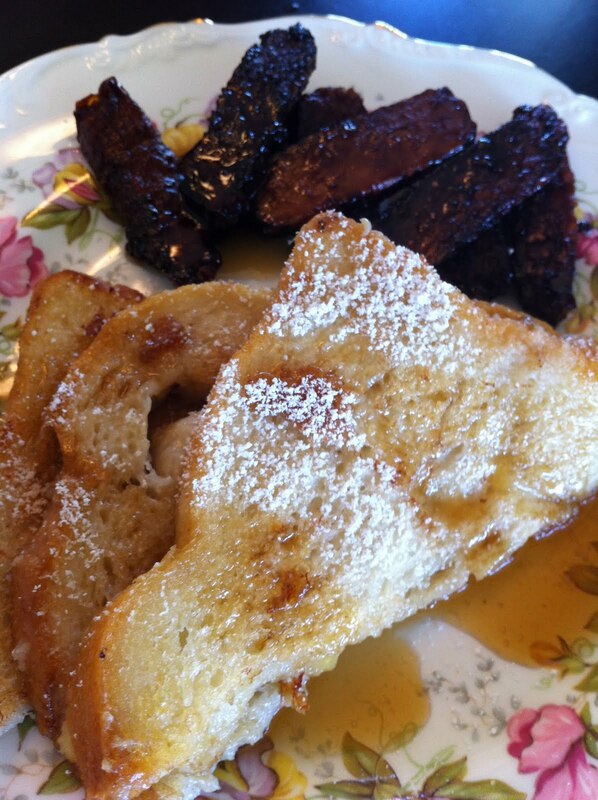 Sunday Brunch: French Toast & Tempeh "Bacon"
Inspired by Rip Esselstyn’s Engine 2 Diet, I love making his french toast. It is an easy and creative way to get the french in the toast. With my tempeh bacon on the side doused in maple syrup, it is a home run! Slice the tempeh the short way as thin as you can. In a shallow but wide dish, whisk together the tamari, maple syrup, and apple juice. Lay the tempeh slices in the dish and slosh it around to get the tempeh coated on all sides. Marinate it for 4 to 5 hours. This will soften up the tempeh as well as give it time to absorb the flavors. In a skillet, heat up safflower oil on medium high heat. Set the tempeh strips in the oil and let it go for 7 or 8 minutes. Turn them over and cover the tempeh with the rest of the marinade. Let it go until the strips are carmelized. The excess marinade will cook off. Mash the bananas in a shallow bowl. Add the almond milk and vanilla and whisk together. In a non stick skillet, melt the Earth Balance. Dip the bread into the mixture and coat it well. Drop it right into the skillet and cook it for a few minutes on each side until lightly browned. Dust with powdered sugar and top with maple syrup. Eat it hot!